When it comes to glowing hydrated hair, many women think that they need to turn to costly cosmetics and expensive patented elixirs. The real solution couldn’t be further from the truth – the best way to achieve naturally radiant beauty, you don’t need to look any further than pure Moroccan argan oil. Unlike harsh chemical solutions, real argan oil is a ‘fountain of youth,’ a hydrating and rejuvenating oil derived from Northern African tree nuts. Prized by cosmeticians and dermatologists around the world, argan oil is packed with Vitamin E and fatty acid content. This unique combination is known for its anti-aging properties, and real argan oil delivers. Whether you buy argan oil online or at its source in Morocco, its benefits will transform your skin and hair. Here are our top 5 favourite argan oil facts. 2. It has been used for thousands of years – Women (and men!) in Morocco have been taking advantage of the soothing and moisturizing effects of argan oil for millennia. The Sahara Desert is a harsh, dry place, and the oil extracted from the argan nut can help to counteract the drying effects of the environment. 3. Argan oil is completely unique – It’s true! Argan oil can penetrate the epidermis layer of the skin far easier than most oils, including the famous coconut oil. Real argan oil contains a lipid called squalene. As we age, our skin becomes depleted in squalene; thankfully, argan oil naturally contains this very ingredient. It boosts hydration and oxygenation, and encourages cell regeneration. Since squalene occurs naturally in our sebum (skin oil), it is absorbed easily and really makes a difference in how your skin looks and feels. 4. 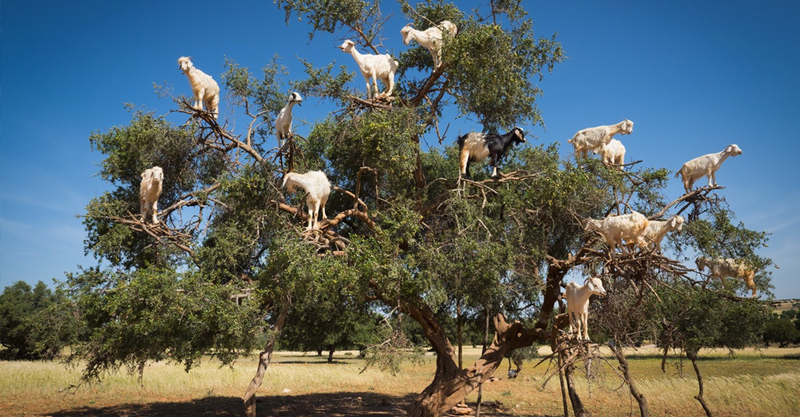 It’s all about the goats – Goats are so interested in the argan nuts that they will actually climb the trees for a chance to munch away! While the sight of kids clambering up trees is something tourists appreciate, the highest quality argan oil is not by way of the goat’s intestinal tract.